The main purpose of going to work is to earn money, at least for most of us who aren't out saving the world or curing cancer. On a typical day at the office, the hapless corporate worker encounters so many money traps he might as well be on a shopping spree. Let's have a look at the perilous journey from home to work and back. When the alarm goes off, as usual you find it hard to open your eyes. Shouldn't have spent the entire night watching videos on Netflix or playing PUBG, eh? You snooze the alarm. In your half-sleep, you lie in bed contemplating whether you should deliberately show up at work half an hour late just to get a bit more sleep, but decide against it since your boss hasn't been in a good mood lately. You should be able to get a cab if you call for one now, since it's only 7.30. Calling for a cab will not only buy you an extra 45 minutes of sleep but also save you from the bloodbath that is the rush hour MRT ride. If you managed to make it to work without succumbing to the temptation of taking a cab, you're so sleepy you're about to fall flat on your face. At 11.30am, you're already staring at the clock, willing your boss to shut up and leave so you can sneak out for an early lunch. By the time you actually get to leave it's 1pm, and trying to take the lift downstairs is like trying to get on the MRT at 8.30am-after a bunch of false starts, you finally manage to squeeze in as the door shuts inches from your face. By the time you get to the hawker centre, it's already 1.15pm, which is the time at which competition for seats at hawker centres gets really cut-throat. Your colleagues are all going for lunch at some new hidden cafe owned by a radio DJ that's so exclusive you need a map and a metal detector to find it, so you tag along because you don't want to eat alone. You spy in the window a work dress or crisp looking shirt that would look right at home at the office, on your body that is. Besides, your boss has been complaining that you've been turning up at work looking sloppy. Ten minutes later, you emerge with a new work outfit, which you have spent one third of your day's pay on. $60, gone. Then, after getting back from lunch, your stomach tries desperately to digest your lunch and your brain switches off. You know you've lost all hope of getting any more work done the rest of the day. So you log on to Lazada or Zalora and start browsing away, and before you know it you've bought a new pair of jeans. Another $50, busted. Every other day, a colleague is getting pregnant, leaving the company, retiring, or getting promoted, and you're required to contribute to gifts. Today, Designer Audrey is leaving the company and your team has decided to buy a group gift for her. Never mind that you've only spoken to her twice during the whole of your 6 months' tenure in the company; you contribute $10. Since you've lost so much weight during your yoga sesh, your body, if not your wallet, can probably afford a good meal. It's already 8, so rushing home to cook is out of the question. However, the thought of sweating it out at the hawker centre is too much for you at this time of night. Besides, you just took a shower at the gym and don't want to go home smelling of char kuay teow. Meal prep: The truth is that a lot of money can be saved if you're not FOMO. If you are able to budget your groceries every month, you can control how much you spend on food, as well as how much calories you are eating. Curb impulsive shopping: Set rules when it comes to shopping. You don't need every single gadget or clothing out there, so set dates to shop rather than give in whenever you see a product that sparks your interest. If online shopping is your drug, unsubscribe from mailing lists so you stay blissfully unaware of new promotions and launches. 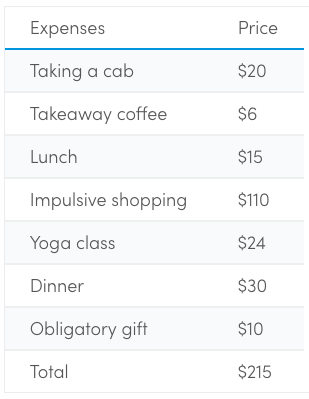 Know how much exactly you're spending when you go to work. Cutting necessary daily expenses will mean that you will be able to save and invest more, inching you towards financial freedom.